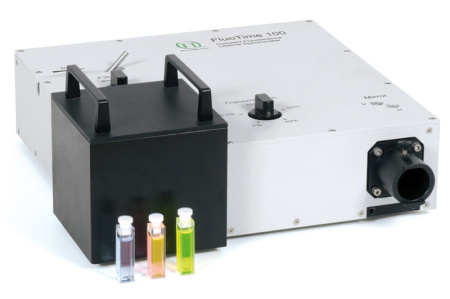 The WaferCheck 150 system is a complete and easy to use system for Time-Resolved Photoluminescence (TRPL) measurements. Time-Resolved Photoluminescence (TRPL) measurements. TRPL is a very powerful tool for the contact-free characterization and investigation of semiconductor materials. It is non-destructive and involves only light as a probe. It can be used for everything from raw materials to in-process intermediates to finished devices. These capabilities qualify TRPL as a valuable analysis tool for research, testing and quality control. The WaferCheck 150 is designed for 10 cm wafers (other sizes on request), which are placed on a manually rotatable table that allows to measure at different spots of the wafer. The system uses miniaturized picosecond pulsed light sources along with electronics for recording fluorescence decays by means of Time-Correlated Single Photon Counting (TCSPC). The emission is spectrally filtered by different high quality filters. As standard detector a fast and reliable photomultiplier (PMT) of the PMA series allows detection of decay times down to 60 ps. Even faster decays down to 10 ps can be resolved using a Multichannel Plate Photomultiplier (MCP-PMT) as detector. All data acquisition functions of the WaferCheck 150 are controlled by an easy to use software for Windows. Data analysis is done using FluoFit, which allows reconvolution of complex decays, saving of results and parameters, etc.